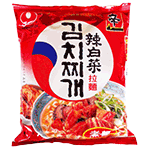 Nongshim Kimchi, the flavor of Korea enjoyed by the rest of the world! Made with the finest vegetables and combining it with our unique spices, we bring you the most unique Noodle Soup you can ever enjoy. Nongshim products are among the top selling Ramyun products around the world. We hold the top spot in this category in various countries. The reason for this success may be attributed to the unique flavor and convenience of our products. It's as simple as boiling water in a pot, adding the noodles and the soup packages, and in 4 to 5 minutes you have a delicious Noodle Soup. Our Bag Noodle product creates a delicious and convenient meal that can be shared with your family and friends. You can also personalize this soup by adding your favorite ingredients. This soup achieves a harmonious balance between soups and noodles!